Pre-engineered steel buildings are the most sensible choice, when it comes to customizable, inexpensive, ultra-durable structures for commercial purposes. 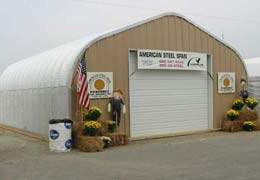 Whether you are building an auto shop, aircraft hangar, or starting or expanding on a mini-storage business, the sheer flexibility of steel building systems make them ideal for these ventures. Add customized doors and openings for fractions of the cost of any other structure on the market, with the knowledge that your structure will be secure and weather-tight and warranted to last. Not only are these structures solid and secure, but they look fantastic. Explore our photo gallery for a sampling of the multiplicity of attractive, sensible designs and finishing options that steel offers to proudly represent your business. 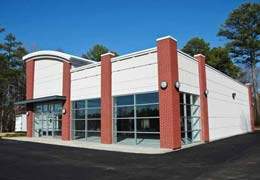 If you are considering a pre-engineered steel building for commercial purposes, then you must visit our Commercial Blog, for articles and pages to inspire your interest and assist you in making the best decisions when it comes to constructing for your operation. Don’t forget to capitalize on steel’s environmental benefits as well, as governments often offer incentives to Go Green to commercial and industrial builders.